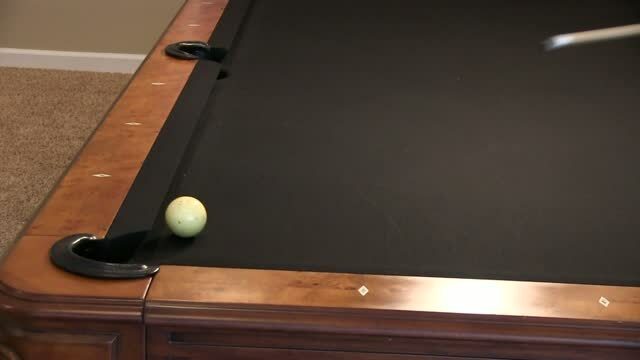 This is a great drill done indoors without the distraction of a target. It will help you develop feel for returning your putter face back to square. The Putting Block Drill is a drill designed to help you get your putter face back to square on all length putts. This drill is all about getting pinpoint accuracy with your putting stroke. The Hip Bump Drill teaches you how to properly use your hips in the downswing. If you have problems starting down too early with your upper body or arms, this drill will get you activating your lower body first. This is a great drill for stopping the all too common wrist flip when chipping. The Putting Tile Drill is a path drill that is designed to help you build consistency with your back and forward stroke. It also helps to train your eyes as to what a square face looks like throughout the stroke. 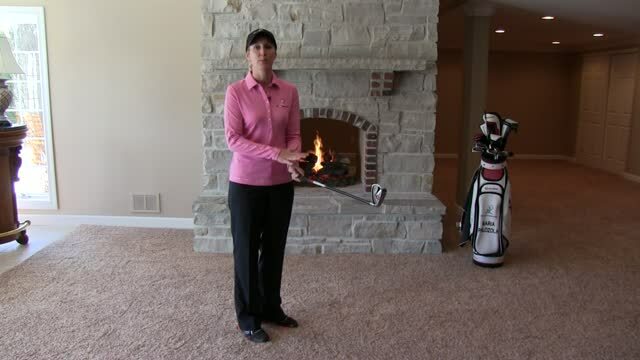 This is a great drill for learning to hit your landing spot when hitting lofted chip shots. The Sway Blocker drill is a fantastic drill for eliminating a backswing lower body sway off the ball. The Putting Penny Drill is designed to help you narrow your focus on the greens and increase your putting accuracy. To increase your accuracy on your putts you need to shrink your target. 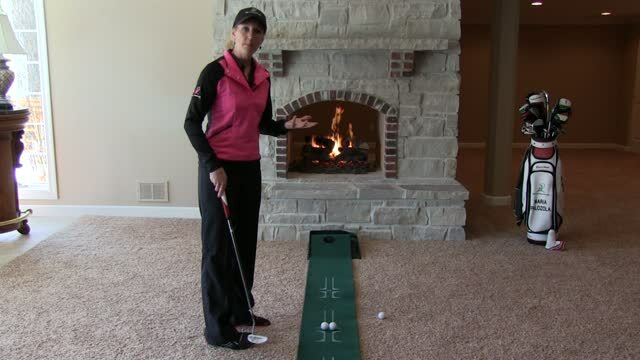 The Putting Box Drill shows you an effective way to do just that. The Hanger Release Drill is the perfect drill for testing to see if you have the proper release of your hands and arms through impact. The Putting Yardstick Drill helps you work both on the length of your stroke as well as your path. Working on keeping your arms connected throughout the swing is easy with this Tube Connection Drill. It will help you arms stay together and work as a unit throughout the swing. It will also help you keep your arms working in sync with your rotating chest and shoulders. The Book Putting Drill is a wonderful indoor drill for working on your path, face and centerdness of contact. 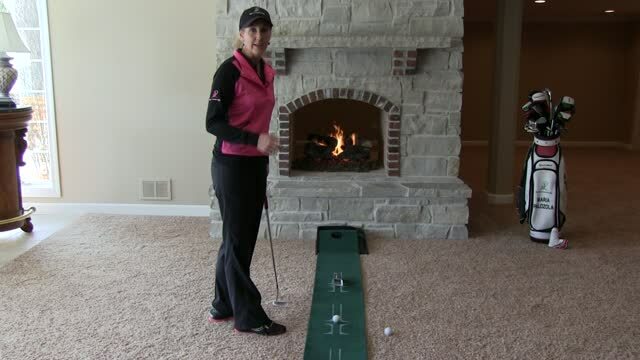 This is a great indoor drill that will help you learn to control the carry on your chip shots. This is an excellent drill that you can do indoors to make sure you are getting into a posture position that will lead to balance, power and flexibility. This is a great drill for making sure you get your arms on plane and that they stay connected at the top of the swing. It is especially effective for checking the position of your lead arm (target side arm). This drill done indoors is a great drill for learning to return the club to the ball with perfect impact alignments maximizing both control and distance. This is a great little drill that can easily be done inside to test your critical lead hand position on the grip. This would be the left hand for right handed golfers and the right hand for left handed golfers. It is the hand that essentially controls the club face. This power drill will help you maximize your coil on your backswing to increase club head speed. This is a fantastic drill for working on your swing plane indoors. It will help you check to see if you are on plane at various key points throughout your swing. This drill will help you monitor your putting stroke for 2 major flaws. It will help detect both excessive head movement along with path errors. This is a great drill for learning to maintain a constant arc throughout your backswing. This is a great drill to make sure your takeaway is on plane and that you are not laying the club off (swinging it too far behind yourself) right out of the box. This is a great drill for eliminating too much up or down or side to side movement in your putting stroke. Excess movement makes striking the ball in the center of the face consistently a challenge. This is a great indoor drill that will help you maintain your posture throughout the golf swing. An improper title no doubt, but this is a drill that really works and will help you not only achieve more accuracy by keeping your swing center the same distance from the ball throughout the swing, but will also help increase distance by encouraging more rotation through impact. This drill helps you to sync up your arm swing with your body pivot. The result is ultimate control and accuracy while staying on plane with pitch shots into the green. This drill trains you to master your splash away from the sand and learn how to utilize the bounce on your club to your advantage. 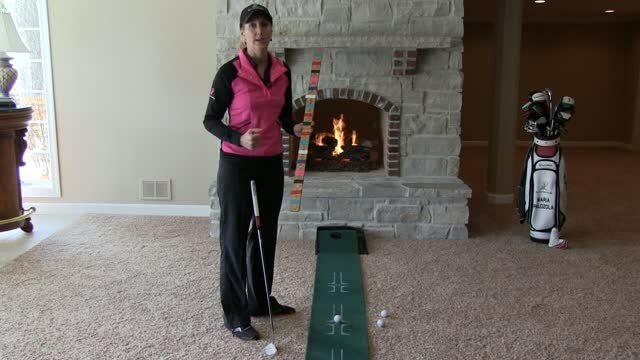 This is a fun little drill you can do on the go while you travel or at home to improve your accuracy with your putter. The Indoor Takeaway Drill teaches you how to hinge your wrists more quickly to ensure you are not laying it off on your takeaway.